Today's guest post is brought to you by Joy Mac and it's all about the importance of dog toys... *Cough* Like our Kong Squeakair! No matter what breed, or how old they are, dog toys are important for dogs. People normally think toys as a plaything for leisure or passing time. Although, the fact, is that toys are very essential for dogs due to various reasons. To avoid boredom, toys serve as a past time for dogs. Normally a dog that is bored is bound to do unpleasant and naughty things. If mutt has a toy to play with, it is able to do some valuable activities with the toys. Today, dog owners will find a myriad of dog toys in Australia that are of different types, suitable for different purposes. One of those, an active type toy, is a loofah pet toy that is durable, non-toxic and capable to satisfy the chewing needs of dogs. Loofah pet toys come in different shapes and sizes, as well. 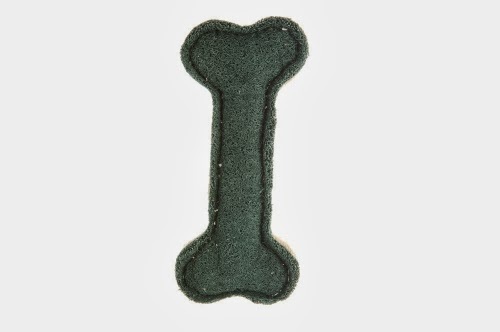 Loofah tennis balls and dog bones are among the favorites of many pet dogs. While purchasing loofah balls, dog owners need to make sure that they are not too small for the dog to swallow. It is normal for dogs to chew anything that it feels like chewing. That is why, owners need to provide toys to their dog so that their beloved mutt will chew the toy rather than anything else. There are distraction toys available, as well. These are the toys that lure the dog away from destructive activities. Dogs certainly enjoy such toys, especially when the toys are filled with some treats. When the dogs play and chew with such toys, they also get the chance to eat the treat. Loofah pet toys with certain shapes can also act as distraction toys. Loofah pet toys in mouse, rabbit, or any other animal shape will lure the dog away from destructive activities and incite them to play and chew the toy. Interactive dog toys are essential as well since they help create a good bond between the dog and its owner. Some of the popular interactive toys include Frisbees, balls, and ropes. Dog and its owner can both enjoy playing with Frisbee and ball in the outdoors. These toys provide physical exercise to the mutt, as well. With toy ropes, dog and its owner can play tug and pull, which many dog breeds find exciting. To conclude, toys are essential for dogs as they affect their both mental and physical states. Besides, with toys to play with, dogs will refrain from destructive activities, such as chewing their master’s precious belongings. Joy Mac is contributor writer and guest author. She likes to write article on different topic related to pets likes cat toys, dog toys, pet accessories, pet clothing and many more. We scotties don't play with toys much. We do enjoy tug-o-war with a rope or stuffie. Roxy, though, loves anything with a squeaker. We have lots of toys but peeps is on the hunt for something for ancient Pip. We are looking for an activity toy to keep Pip amused. Have a fabulous Friday.